Perhaps I am not being the least bit modest but I can honestly say that words cannot express how much I love this layout. I worked on it from beginning to end. I sketched it out on a piece of paper, grabbed my supplies and photos, and made it happen. I feel like this layout completely portrays my own personal scrapbooking style. The neat alignment, pile of embellishments, use of kraft paper and lovely colors. It's all me! I have never been so happy with a completed project before. I really hope to do more layouts like this. I have so many random pictures of my daughter that don't necessarily tell a specific story, yet I still want to scrapbook them. I decided a good idea would be to list a few random facts about her. However, I needed to make a layout that would allow for a lot of journaling which is where the banner came into play. All of the papers (aside from the kraft) are My Little Shoebox (Lovely Day). The papers and journaling spots that make up the banner are also from this collection. The cluster of embellishments are a mixture of My Little Shoebox (Lovely Day) and American Crafts. I even took apart some of my American Crafts embellishments, altering them to fit this layout specifically. 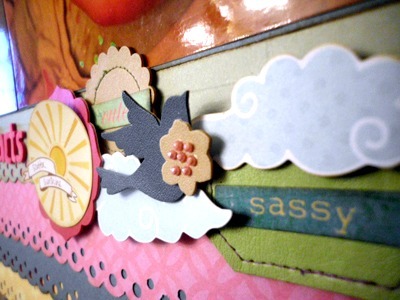 The title is made up of My Little Shoebox (Lovely Day) alpha stickers and AC Thickers. The little word stickers are from Crate Paper (Emma's Shop). The punch used is Martha Stewart (Scallop Dot). I also made a card. Now, I am not much of a card maker. It just doesn't come natural to me like so many of you talented ladies. Nonetheless, here it is. After messing around with the soft blue and pinks, I decided to make it a baby card. 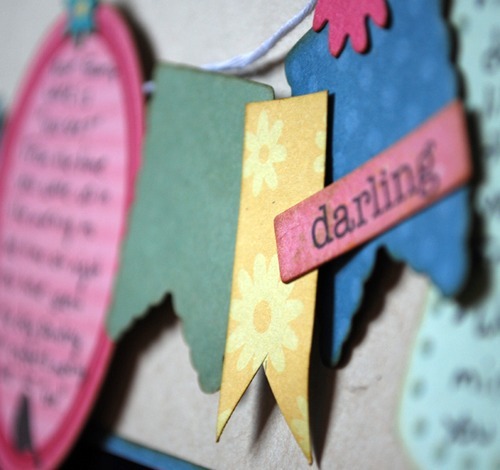 All of the supplies used to make this card are, again, My Little Shoebox. In fact - the only things that are not My Little Shoebox are the frame around the picture (Colorbok), the doily, and the blue cardstock. these are great! I am not much of a card maker myself - yours turned out great!!! 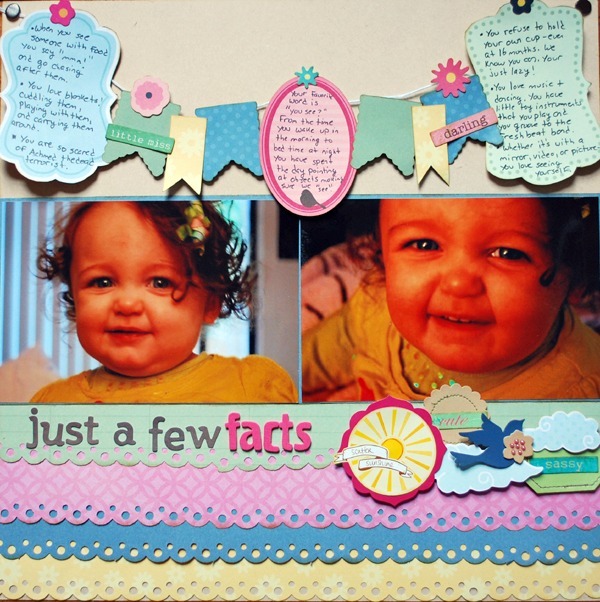 I have to disagree about you not being a card maker, this is so cute and I love the "baby makes 3" sentiment. Both projects are great. Love the banner on the lay out. TFS! She's so adorable. Such a sweet layout and that card is so pretty. Modesty is for the meek! :) I like me a sassy brave woman who knows what she likes and isn't afraid to shout it out the nearest mountain top. This page looks terrific! LOVE the banner and your baby is a CUTIE- great photos! 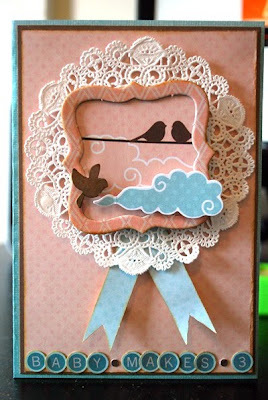 I also really love the card- the layering there is fantastic- great touch with the doily edge! Thank you so much for being so enthusiastic about my blog and for following along! I like what i see here so I will follow as well.! Such an adorable card! I love everything about it!